Brian and Jeff talk with Ann McMahon about sharing one’s passion for engineering with pre-college students. Brian has experienced the glassy-eyed look of others listening to his engineering stories. Our guest for this episode is Ann McMahon, an aerospace engineer who advises educators on how best to share science and engineering with K-12 students. Ann originally wanted to be an astrophysicist, but ended up in the aerospace industry after acquiring degrees in mechanical engineering. After a career with McDonnell Douglas, our guest started volunteering in her son’s classroom; this led to an interest in educational matters. For the past decade, Ann has been working with the Smithsonian Institution’s National Science Resources Center as a National Faculty member for a program called Leadership Assistance for Science Education Reform (LASER). Some existing programs for introducing engineering into the classroom include Project Lead the Way, and Engineering is Elementary. Brian wonders if engineering will ever be taught as its own subject; Ann is hopeful that schools are moving their curricula in this direction. “Wicked” problems are complex issues that have no “right” or “wrong” answers; and each possible solution presents even more potentially unforeseen consequences. In comparison, “tame” problems are definitively right or wrong, and lack the complexity of real-world issues. Having right or wrong answers, rather than evaluating tradeoffs, misses the essence of the engineering profession. It will likely take time for educators to determine how to assign grades in the absence of easily-defended solutions. An effort is being made in many classrooms to emphasize non-cognitive skills, such as collaborating, taking on the perspectives of others, arguing from evidence, and getting along with other team members. Susan Cain has recently released her book, Quiet: The Power of Introverts in a World That Can’t Stop Talking. The concept of an “object world” is introduced in Designing Engineers by Louis L. Bucciarelli. Ann recently gave a TEDx talked titled Engineering Empathy (use password tedxgladstone). We learn best when we are supported by relationships with important others who help us stretch to master new challenges and cope with potentially overwhelming situations. Relationships that a child has with a teacher and peers at school are influenced by the child’s earlier experiences. 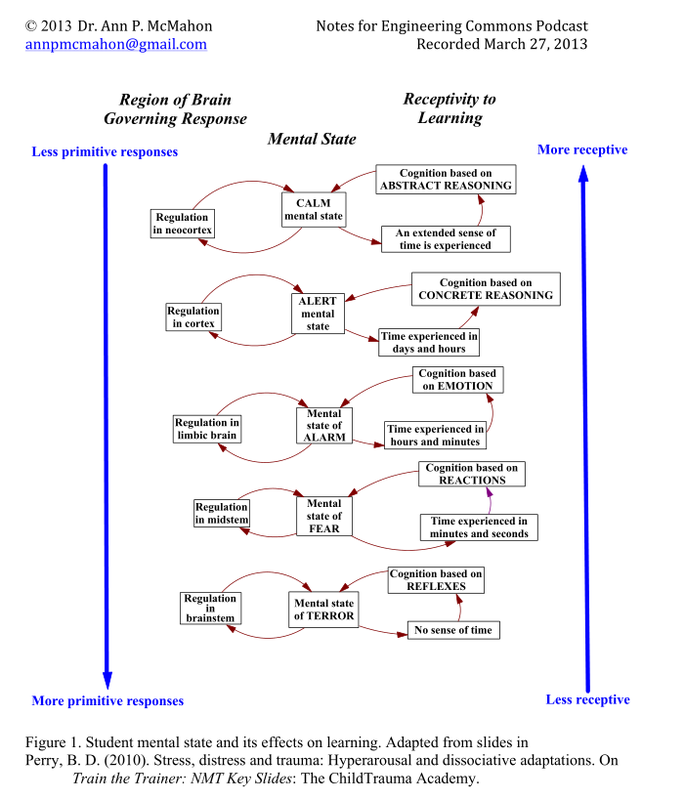 Our ability to learn is influenced by our mental state, as indicated in the following diagram. Ann believes that engineering offers unique opportunities for students to acquire important cognitive and social skills, including a chance to practice emotional regulation. 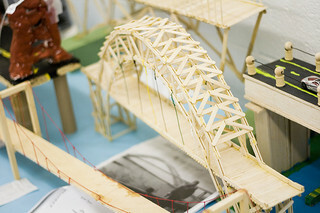 Design competitions are great for some students, but others may not thrive in such an environment. Sharing what we know, at an appropriate level, is the best way to convey our interest in engineering with students. Ann can be reached at annpmcmahon *at* gmail.com; or found online at AnnPMcMahon.com.